Guitar tab didn’t start showing up regularly until I was in my twenties. Before that, learning songs was mostly a matter of listening to recordings and trying to play what you heard. This could take anywhere from hours to weeks, depending on how hard a song was. Even relatively easy songs could take a little tinkering if your ear wasn’t the best at catching all the little nuances. I still remember when tablature started to show up on a regular basis. Publishing companies started releasing books that matched albums. The books were called note for note transcriptions. The publishing company Hal Leonard had all the good stuff—the stuff I wanted to play-in a series called recorded versions. The transcriptions were excellent and suddenly I could open a book and have access to anything I wanted to play. The trouble was, some of it was way out of my league, so I had to simplify it by picking through the notation and finding only those parts of the songs necessary to make it recognizable. Those are the parts I’d learn first. Today it’s even better. Those guitar books were expensive. I had to pick and choose carefully because I could only afford so many of them. Everything else I still had to learn by ear. That’s not the way it is now. The Internet is full of guitar tab web sites that carry just about any song you can think of, not only in note for note transcriptions, but in easy guitar tabs songs format that even a beginning guitar player can start using to play right away. 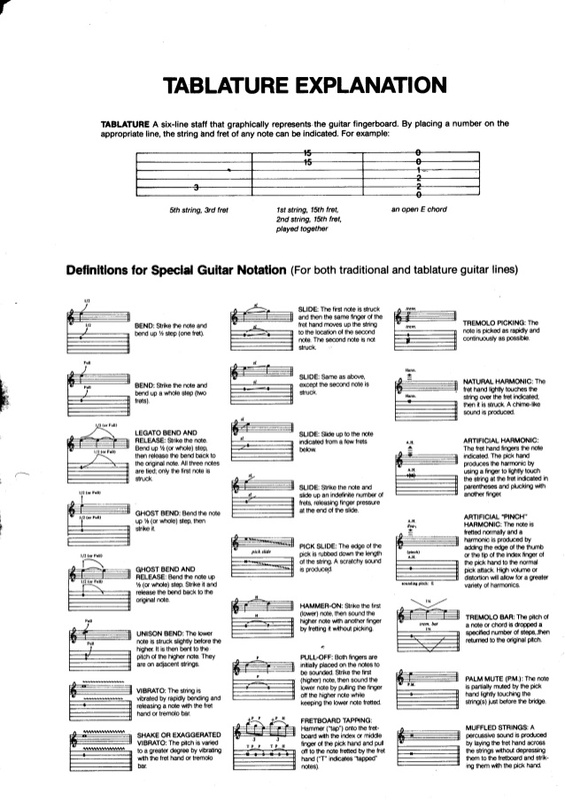 The chart below shows some of the notation conventions found in guitar tablature. Even if you can’t find easy guitar tabs songs for the songs you want to play, you can almost always find a chord progression to the songs you like, and the chords are all you need to get a handle on what you need to know to play. Give it a try. Grab one of your favorite songs transcribed with just chords and lyrics. Play the chords while you sing and you’ll be able to hear the harmonic structure of the song pretty easily. If you take the chords and lyrics and have them in front of you while you listen to a recording of the song, you’ll be amazed by how easy it is to figure out a song without having full tabs. One thing to keep in mind when you use the Internet, though, is that the songs you find are uploaded by users of the web site in many cases. This means there’s no real quality control. Sometimes the transcriptions you find aren’t as accurate as you’d like them to be, especially if they’re easy guitar tabs. Sometimes you’ll find them in a different key than the recorded versions. The best way to make sure this doesn’t happen to you is to listen to the recordings as you play through the tabs you find. Listen carefully to make sure what you downloaded is what you want to play. Once you know you have the right arrangement, pick through the transcription like I suggested earlier and find those sections of the song that are recognizable and necessary to the overall presentation. Learn those first. You can learn the more complex stuff at your own pace, as your playing improves.